Days removed from one of the most bitter election cycles in the history of our country, Americans this weekend are just beginning to get over either their euphoric excitement for the victory of Donald Trump and many other Republicans — including North Country U.S. Rep. Elise Stefanik — or their post-poll Democrat depression after Hillary Clinton’s stunning loss. The results are final, and much like a football game, the only stat that matters four days removed from election night for President-elect Trump is that he is the victor and will be the 45th president of the United States of America. But also much like a football game, where is the fun and insight to how America, New York and the Tri-Lakes ended up where they did Wednesday morning without diving deeper into other statistics and numbers that got us all there? 0.91 — The percentage difference between Clinton (45.9) and Trump (45.0) in Clinton County, the only North Country county Clinton won Tuesday. It was the closest margin of victory for either Trump or Clinton in any of New York’s 62 counties. 1 — The percentage increase of turnout among women voters compared to 2012, according to early exit polls, as Clinton received the support of 54 percent of women compared to Barack Obama’s 55 percent in 2012. 1 — The percentage difference between Democrat Mike Derrick (48) and Republican victor Elise Stefanik (47) in North Elba. Though Derrick performed well in the Olympic Region, he lost all 12 North Country counties to Stefanik. 2 — The average frequency in minutes a pro-Clinton or anti-Trump TV advertisement aired in Florida in October, according to Center for Public Integrity reporter Michael Beckel. 2.2 — The percentage difference in votes between Clinton (263 votes) and Trump (251 votes) in the closest margin of any town in the Olympic region, Wilmington, where Clinton won 46.7 percent to 44.5 percent. 2:31 — The time Wednesday morning that Trump crossed the 270 electoral vote threshold with a victory in Wisconsin, according to Associated Press projections. 4 — The number of emails and email attachments that contain the term “Donald Trump,” of of 30,322, sent to and from Hillary Clinton’s private email server while she was Secretary of State from June 30, 2010 to August, 12 2014., according to a search of the Wikileaks Hillary Clinton email archive. 5 — The number of states Donald Trump has won that Mitt Romney lost in 2012: Ohio, Florida, Iowa, Pennsylvania and Wisconsin. 5 — The number of times in 49 presidential elections since 1824 where the winner of the presidential election was not the winner of the popular vote. The popular vote was not recorded prior to the 1824 election, discluding the first nine presidential elections. Along with Trump-Clinton, the other races were George W. Bush (-0.51 percent) vs. Al Gore in 2000, Benjamin Harrison (-0.83 percent) vs. Grover Cleveland in 1888, Rutherford B. Hayes (-3 percent) vs. Samuel Tilden in 1876 and John Quincy Adams (-10.44 percent) vs. Andrew Jackson in 1824. 6 — The price in dollars of a “Hillary for prison” button three-pack listed on Trump’s campaign website in October. 6.2 — The percentage drop of the share of votes in the Congressional District 21 race for return Green Party challenger Matt Funiciello, who took 4.4 percent of the vote Tuesday after winning 10.6 percent of the vote in 2014. 8 — The percentage of black voters who voted for Donald Trump, according to Edison Research for ABC News, AP CBS News, CNN, Fox News and NBC News. 9 — The decrease in the percentage of voter turnout in Essex County in 2016 (65 percent) compared to 2008 (74 percent). 10 — The number of polls the day before the election that Trump led, of the 45 accounted for on the RealClearPolitics website. 11 — The number of women verified by CNN who came forward during the election cycle to accuse Trump of sexual misconduct. 16 — The percentage difference of voters 65 and above who opted for Trump (53 percent) and voters 18 to 29 who voted for Trump (37 percent) according to Edison Research for ABC News, AP CBS News, CNN, Fox News and NBC News. 20 — The percentage difference from Barack Obama’s general election margin of victory in Iowa in 2008 to Hillary Clinton’s margin of loss in 2016. 24 — The percentage gap early exit polls results showed between how much Hillary Clinton won women by, 12 points overall, and how much Trump won men by, 12 points overall. 28.6 — The final percentage chance Nate Silver and the political forecasting website FiveThirtyEight gave Donald Trump to win the election before Tuesday. 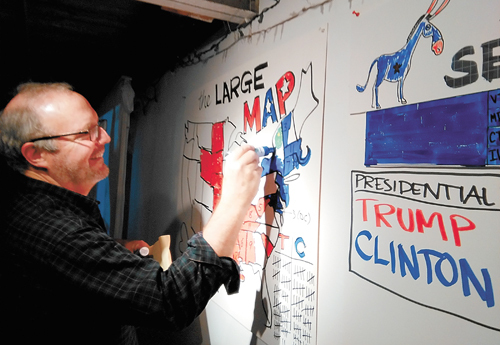 34.8 — The percentage difference in votes between Clinton (373) and Trump (167) in the largest margin of any town in the Olympic region, Keene, where Clinton won 63.1 percent of the vote compared to Trump’s 28.3 percent. 38.2 — The percentage of the vote Republican Terrance Guido Gerin, who works professionally for World Wrestling Entertainment under the moniker “Rhyno,” received to represent Michigan’s 15th District, Wayne County. He lost the race. 52.9 — The percentage of 47,716 Franklin County and Essex County voters who cast their ballots for Democratic U.S. Senator Chuck Schumer. 70 — The lowest percentage of the vote Republican incumbent Dan Stec garnered of any election district in the Olympic Region. 70.1 — The percent of voters who voted for Donald Trump in Wyoming, his strongest showing in any state. 79 — The lowest percentage of the vote Republican incumbent State Sen. Betty Little garnered of any election district in the Olympic Region. 83 — The number of Electoral College votes Trump received from winning Ohio, Florida, Iowa, Pennsylvania and Wisconsin, states Obama won in 2012. 83 — The number of Hillary Clinton voters in the southern Adirondack town of Newcomb. 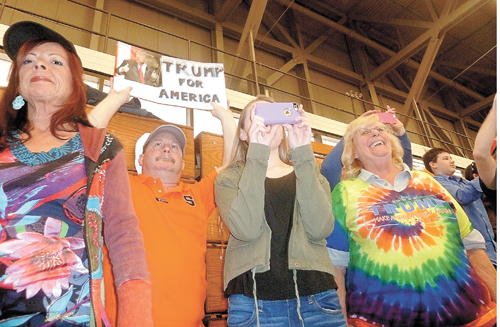 140 — The number of Donald Trump voters in the southern Adirondack town of Newcomb. 249 — The number of counties that voted for Donald Trump of the 250 counties across the country with the highest percentage of white population, including New York’s Lewis County. Lake County, Minnesota was the only to go for Clinton, according to the BBC. 257 — The number of points the Dow Jones was up when it closed Wednesday night, the day of Trump’s election. It tumbled as much as 800 points the previous night. 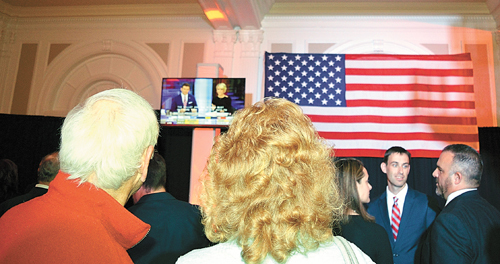 304 — The number of Essex County voters who wrote-in their own candidates for president Tuesday. 512 — Days between Trump’s announcement of his campaign and when he was declared the 45th president Wednesday morning. 577 — Days between Clinton’s announcement of her campaign and Wednesday, when she called to concede to Trump in the early morning hours. 1969 — The year the last time the electoral college system came up for serious debate, as the House of Representatives proposed and passed a resolution that the direct election of a president and vice president, requiring a run off when no candidate received more than 40 percent of the vote. The resolution failed to pass the Senate. 1988 — The last year a Republican won Michigan, Wisconsin and Pennsylvania. 9,312 — The number of voters in New York’s 114th Assembly District who voted but did not cast a vote in the race between Republican incumbent and winner Dan Stec and Green Party challenger Robin Barkenhagen. Barkenhagen received 6,733 votes. 11,953 — The number of voters in New York’s 21st U.S. Congressional District who voted but did not cast a vote in the race between Republican incumbent and winner Elise Stefanik, Democrat Mike Derrick and Green Party challenger Matt Funiciello. Funiciello received 11,399 votes. 15,000 — The number of write-in votes the website dailysnark.com said were received by Harambe, a gorilla who was killed in May after a 3-year-old boy climbed into the gorilla’s enclosure at the Cincinnati Zoo. The report was fictional. 16,441 — The number of voters in the 45th State Senate District who voted but did not cast a vote in the race between Republican incumbent and winner Betty Little and Green Party challenger Steve Ruzbacki. Ruzbacki received 11,301 votes. 56,000 — The approximate number of emails Wikileaks has published from Clinton campaign chair John Podesta’s private email account since Oct. 7. 107,330 — The number of votes Clinton lost by to Trump when combining her losing margins in Michigan, Pennsylvania and Wisconsin. You could fit all those people inside the 107,601 person capacity Michigan Stadium in Ann Arbor for a Big Ten football game. 280,646 — The number of votes ahead in the popular vote Clinton was over Trump as of Thursday morning, with more than 99 percent of precincts reported nationally. 71.43 million — The estimated number of primetime viewers Nielsen estimated watched Tuesday’s election results across ABC, CBS, Fox, NBC, Telemundo, Univision, CNBC, CNN, Fox Business Network, Fox News Channel, MSNBC, TV One and Lifetime, up from the 66.8 million who watched in 2012 and on par with the record-setting 71 million who watched in 2008. 84 million — The estimated number of viewers of the first presidential debate on Sept. 26. 131.74 million — The estimated number of people who cast their ballots, according to the U.S. Elections Project, as of Thursday morning. That means 43.2 percent of an the estimated U.S. voting-aged population of 231.6 million didn’t vote.